This’ll be another long segment. It’s the end of the game! Whoops, ya got me, game! Ya got me good. So earlier it seemed super fishy that there was practically nothing to stop me from sneaking around in the control room by the Metal Gear, right? Neither Liquid, Ocelot, nor any of their guards put up much of a fight despite my obvious attempt to mess with the nuclear launch controls. Turns out there was very simple trap in play here, which is that they hadn’t activated the controls to begin with - thus, when I put in all the keys, it activated the Metal Gear rather than disabling it. I feel very foolish for not seeing through that! Well, it had to happen for the game to progress anyway. Master Miller calls and begins to gloat about how Snake fell for this, explaining that neither Ocelot nor Mantis got Donald Anderson’s activation code to begin with, and thus Snake was deliberately allowed to figure out the operation of the keycard. At this point it becomes apparent that Miller has been, from the start, Liquid Snake in disguise. Y’know, I noticed slightly earlier that the voice acting for both characters sounded very similar despite their different accents, but I brushed it off reasoning that MGS had enough of a budget that they wouldn’t have had to use the same actor for two major characters. That’s what you get for using that kind of meta reasoning with this story, I guess! Liquid then appears in person (now shirtless for no apparent reason) and goes into a further monologue about his schemes. The deception about the keycard was planned since just after Snake’s capture, and it’s even implied that Wolf and Raven were unwittingly expended just to give Snake the impression that he was still considered a threat to Liquid’s plans. That’s… some pretty clever villainry, I gotta admit! Liquid goes on, and resolves some mysteries about his and Snake’s background. Turns out they’re twin clones of Big Boss, created as part of a top secret super-soldier experiment. Liquid is deeply bitter that, as part of the process, all the “dominant genes” were artificially transferred to Snake, leaving Liquid as “genetic garbage” as he calls it. I mean, as reasons for becoming a super-villain aiming for revenge and global catastrophe go, that certainly holds up! He’s not done talkin’ at us yet, though - his final reveal is Snake’s manipulation by the government. 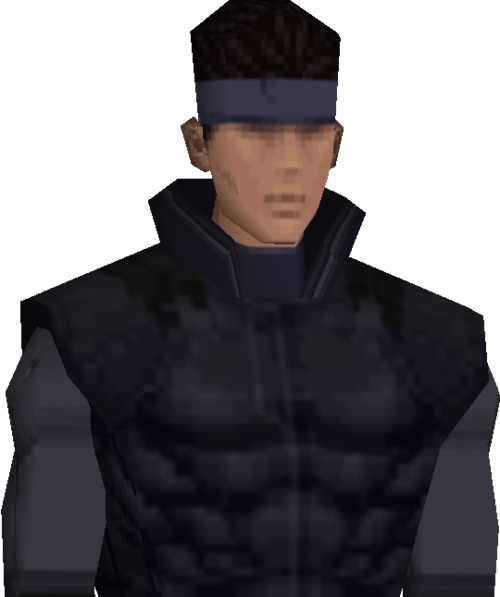 He claims that Snake was injected with FoxDie so that even if he wasn’t successful in defeating Fox-hound in combat, he’d kill them just by spreading the virus throughout Shadow Moses Island. This bit of trickery is one more element that helps the plot feel like an homage to retro spy movies, where you could often expect the hero to be double-crossed by calculating higher-ups. Now that the Metal Gear is all warmed up, Liquid hops in, ready to finish Snake. The battle with the Metal Gear takes place in a large arena that, somewhat disappointingly, bears very little resemblance to the room we were in ten seconds ago. Aside from that, it’s a very impressive boss, not just as a climax to the story, but also from a technical standpoint. Rex is every bit as huge as it’s been built up to be, with its three-story height and multiple moving parts animating and functioning well beyond what I’d thought this game’s engine would be capable of. For combat mechanics, I of course called Otacon immediately, and he very helpfully explained the Metal Gear’s weak points: destroying the radar dome will force the cockpit open, making Liquid himself vulnerable. As with most of the other boss fights in this game, it took me a few deaths and restarts before I learned how to avoid all the attack patterns, but luckily I still felt very comfortable with the Stinger missiles from the helicopter fight which are used again here. After dodging numerous bombs, bullets, and lasers, I destroyed the radar, triggering a mid-fight cutscene. Turns out the radar’s hanging on by a thread, but the Cyborg Ninja aka Gray Fox leaps into the fight to try to stall the Metal Gear’s attacks while Snake takes the final shot. Unfortunately Snake hesitates, and the two have to hide before making another attempt. This gives them a brief moment to talk, and Fox now seems to be more like the man Snake once knew, now more coherently able to explain the suffering he’s been through since his supposed death. Snake also mentions Naomi, and Fox reveals that he was in fact the one who assassinated her parents, but took her in because he didn’t have the nerve to leave the young girl to die. Jeez, when I thought that bit of backstory couldn’t get any heavier! Unless they factored into the previous games, I don’t think we know anything else about Naomi’s parents, but it may be interesting to learn more about their significance if Naomi herself returns in future installments. When Snake and Fox get back to fighting the Metal Gear, it doesn’t go as planned, and Fox ends up getting killed in a sequence that was altogether more violent and dramatic than I’d expected even at this point. Nevertheless, the cockpit is now open, and it just takes a few more missiles to ker-splode the Metal Gear once and for all. Liquid’s not done yet, though; after all, we’ve already witnessed his ability to walk away from exploding vehicles unharmed. While Snake is briefly knocked out from the final explosion, Liquid drags him to the top of the Metal Gear. Though the Metal Gear is no longer active, the danger’s not over; at Liquid’s suggestion, Snake calls Campbell, who confirms that the Pentagon has issued orders to nuke the facility, as this would wipe out almost all traces of both the Metal Gear and “Les Enfants Terribles” projects. In addition, Campbell reveals why he hid so much information during the operation; the Pentagon had assigned Meryl to Shadow Moses Island to deliberately place her in harm’s way, using her as leverage against Campbell in order to keep him from divulging secrets to Snake. All this time, there have been many references to “The Pentagon” making all these shifty plans, and now we finally learn exactly who’s behind it: Secretary of Defense Jim Houseman personally interrupts the call while placing Campbell under arrest. It’s clear right way that he is a complete and utter badman, as he smugly confirms that the bombs will be dropping on the island in just a few minutes. Despite their remaining time being so brief, Liquid has seen fit to concoct a final duel between himself and Snake the cheesiness of which is truly worthy of the spy films I mentioned earlier. He shows Snake that Meryl, still wounded and unconscious, is there on the Metal Gear with them. Next to her is a time bomb, which um, I’m not sure is necessary considering the imminent nuclear attack? At any rate, it provides a 3-minute timer for a bare-knuckled fistfight, all carried out on the roof of the destroyed Metal Gear, which Liquid is just way too excited about. Cheesy as it is, it is kind of a fun little setpiece, though at times it felt more like a battle against the d-pad based movement and simplistic melee mechanics than against an embittered clone brother. After punching Liquid the heck off that Metal Gear, Snake tends to Meryl, who is unsurprisingly happy to see him but is very surprisingly capable of getting up and running out of the facility with him. Otacon announces that he’s gonna stay behind and remotely open security doors to the surface for them; in a show of some of the best character development so far, he explains that his experiences here have finally taught him reasons to feel good about the life he’s lived, so he’s now prepared to sacrifice himself for others. You were, in the truest sense, a good nug Otacon. There’s one final action sequence left. Meryl drives a jeep up a long tunnel to the surface, while Snake gets to operate a machine gun on the back, gunning down the few remaining genome soldiers standing in the way. Though the gun controls really awkwardly, it’s still an impressive sequence, the maneuverability of the jeep and the long distance covered again exceeding my expectations of the game’s engine. Liquid even shows up in his own jeep, being the sort of villain that just refuses to quit. Exchanging fire back and forth while the two vehicles swerve around each other was, I gotta admit, just plain cool. The two jeeps crash upon reaching the surface, leaving Snake and Meryl pinned under theirs. Liquid does what he’s best at and walks away from his crash, but as he raises his gun to finish Snake, he’s taken down by a heart attack. Snake is just a liiiiitle shaken, since they’d assumed that FoxDie would by its nature kill the two brothers simultaneously, but he seems ok for the time being. Just as Snake’s noticing that there aren’t any bomber jets in sight, Campbell calls with good news: He’s been released, and Secretary Houseman has been arrested instead, for having planned all this without approval from the president. The bombers have been called off, they’re sending a rescue team for Otacon, and there’s even a snowmobile nearby that Snake and Meryl can use for their own clean getaway. Snake asks to speak to Naomi, as he’s very understandably concerned that FoxDie could kill him at any moment since it just took Liquid. Naomi coyly tells Snake to “just go on living”; though never explicitly stated, it’s implied that she may have modified FoxDie’s programming at the last minute in order to give Snake a significantly longer time to live than his brother. I’m not sure if that really fits in with the chronology of when she did and didn’t want revenge on Snake (who, by the way, very tactfully conceals the bit about Fox murdering her parents), but her tone suggests he’s got quite some time. Snake and Meryl hop on the snowmobile, discussing their intentions to basically leave all this behind them and resume Snake’s quiet retirement to the Alaskan wilderness together. The sun rises, there’s some friendly caribou nearby, and… I dunno, the tone of this scene feels a little off. It’s the kinda scene where you get the feeling that it used to be a different scene but then they cut that scene and replaced it with this one, which is just slightly too upbeat. I dunno though, I guess I should be glad these characters have a happy ending (for now) - they had a very rough day! The credits feature some really nice nature footage from Alaska, as well as voiceover repeating Naomi’s lines about how we should go on living. This kind of calm, reflective sequence is appropriate for winding down after such an action-packed war story - it does so a little better than Snake talking about caribou, at any rate. Next post: my final thoughts on Metal Gear Solid! So I’ll start with the gameplay. Was the game fun to play? Well, yes, though with a few caveats that should be fairly obvious. It would of course have benefitted tremendously from an analog stick, but considering the limited hardware I think they did the best they could have with the controls. Navigating a 3D space with a D-Pad is always going to be awkward to some extent, but I did get used to it eventually. This applies to the gun mechanics, too; the notion of bringing up a gun and then using the d-pad to rotate Snake around to aim was really really weird, but the aim assist was very generous and, most importantly, you didn’t really need guns all that much anyway. The handgun and assault rifle were only technically necessary in a couple specific encounters; for dealing with common soldiers, it’s almost always a better option to just sneak around them. The stealth mechanics are quite good, which like, I mean I should hope so given that’s supposed to be a hallmark of the Metal Gear series. If anything I’d say that there were a few sneaking sections that were a little too easy (after I got the controls down, anyway). I saw that the game has an optional hard mode which disables the radar, which would definitely make stealth wayyyy harder, but I think a better adjustment would be something like not allowing me to run up behind enemies at full speed whenever their backs are turned. Aside from sneaking, the other main thrust of the gameplay is the boss battles, which are numerous and varied. I’d mentioned about halfway through that I was pretty impressed with the variety in the boss’ encounter mechanics, and I’ll stand by that having finished the game. Each battle required unique strategies and thus had its own learning curve. For this reason, they certainly felt hard - the only fight I didn’t die to multiple times was Ocelot - but I was surprised to find that I didn’t mind all the restarts much, as it was always part of a process of learning new things Snake was capable of. Next, the visuals. Graphics-wise I don’t have a lot of basis to say “This looks [great/crummy] for a 1998 PSX game” because, as I mentioned earlier, I never owned a PSX and this is literally the first game I’ve ever played on the system. A general statement I’d make is that the environments are very elaborate and detailed, but the character models are not. The base on Shadow Moses Island has a really cool look to it, with detail and distinction put into all the machines, computers, vehicles, weapons, and natural features like the rock walls and snowbanks. They got a lot out of the blocky textures when conveying all the things I just listed. Unfortunately that just didn’t carry over to the characters. Now I understand that the PlayStation definitely had its technical limitations, but in a game that focuses very heavily on its character-driven plot, I’d think they would try to optimize the engine for just a little more detail on the character models. I mean the polycounts are ok, the animations look fairly natural, but it’s the low-res textures - particularly on people’s faces - that just don’t hold up. The two biggest problems are (1) you can’t see anybody’s eyes, they’re just slightly darker spots on their faces, and (2) everybody’s face is a static texture that never animates at all. As I said, this is one area where I think they could have done better even with the existing technology. One game that I did play at around the same time - it released just two and a half months after MGS - was Zelda: Ocarina of Time. Both titles represented attempts to push the boundaries of visual storytelling in video games. They both had highly cinematic cutscenes, as well as dynamic, intense action during actual gameplay. However there’s one such area where Ocarina excelled and MGS didn’t, and it’s visually expressive characters. Let’s google up the in-game models for Snake and Link. 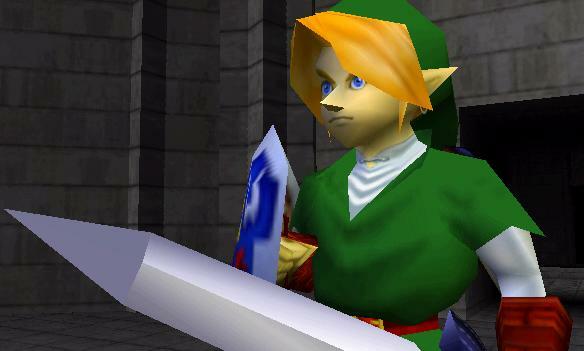 Though from the neck down, Link isn’t exactly a masterpiece of high-res textures, it’s obvious that his face is way more detailed than Snake’s. You’ll remember also that he had a wide array of facial expressions - they represented him grinning when he found treasure, wincing when he took damage, or having wide-eyed surprise when a boss appeared. No character in MGS is capable of any of that. There’s a flip side to that, though - Link had to have all those facial expressions because he had absolutely no dialog to convey his emotions or thoughts. Even the characters in Ocarina who weren’t the silent protagonist had to deliver all their dialog in plain text. MGS had the advantage of a fully voice-acted script, so while I can plainly say that the characters utterly failed to be visually expressive, I will never think of them as lacking personality. It's clear that the voice acting in this game was just great. Really, every actor I can think of did an awesome job. Each character’s personality was apparent within moments of hearing them speak, lines were delivered with distinct emotion, and delivery never fell flat. I even really liked the use of accents for the characters, even if many of them were based on cheesy espionage story tropes. It’s my understanding that many of the voice actors from this game stuck with the series for a while, which I’m very glad of if I’m going to play more of these games in the future. The awesome voice acting is there, of course, to back up the story. It should be no surprise that this is kinda the highlight of the game. Even someone with as little Metal Gear knowledge has myself has heard that the series is renowned - or notorious? - for its complex, involved storylines. Even knowing that, I still didn’t expect it to be quite so heavy in the (sort of) first game. It should also be no surprise that I enjoyed it a lot. The numerous plot threads were intricate, to be sure, but as far as I’m concerned they all came together tightly in the end. It helps a lot that the story is so deeply character-driven. As I’ve already covered, almost every character, even among the diverse cast of villains, gets a detailed backstory, and while the expository dialog can sometimes be lengthy or awkwardly placed, that awkwardness is much more easily forgotten than the characters themselves. I won’t spend too much time on any further character-specific details; I’ll just say that I want to learn more about many of these people and look forward to adventuring with them again in the future. Or past. I think some of these games are prequels.